What have you heard that hasn't been comfirmed, but is an interesting story, none-the-less? Send your rumors to Tom Clayton. The venerable wily Box Fox is rumored to be building a new car called "The Squirt". Bob's current Fox chassis, and its suspension, is known as the inspiration for other cars including the A-Mac and Cheetah. While all of the other latest generation cars are getting larger and larger, Bob is using this as a reason to go smaller. This idea hearkens back to Paul Decker's Mk1/2, which was a minimalist car in its day. That car is pictured below, now owned by Bob Urso. Bob's got more to do (since others are having him build engines for next year), but hopes to have it ready sometime this year. Jim Downing, who earlier (as previously mentioned here) expressed interest in CSR/DSR, has now purchased a Ralt chassis to convert to CSR specifications. While it's not clear whether the chassisis an RT41 or not, the engine will most assuredly be Mazda rotary. There's no word yet on what body work will be used, or the timetable for its entry into the CSR field. It's also unknown who might be put in the driver's seat. Jim Downing of Atlanta, Georgia, is probably best known recently for his role in developing the HANs device. However, Jim was already well known in the road racing community for his Kudzu chassis and his long history of building race winning Mazda rotary engines. Downing has used his building, preparation, and driving skill to win many professional races and championships starting as early as 1980. Photo from Mulsanne's Corner, where you can read an interview with Jim Downing. Jeremy Treadway will drive a brand new Maloy CSR in the Northeast National races with his eye on the 2005 SCCA National Championship at the Runoffs this year. The car will be prepared and run by Stonebridge Sports and Classics LTD of Bethel, Connecticut, who successfully compained previous cars for Treadway. Treadway is well known for his formula ford driving, 2003 Formula SCCA Pro National Championship, and his successful exploits in NASCAR's 2004 Busch North series. "He is well known in the Lime Rock and Watkins Glen arenas as being the guy to beat" in various other classes. Horizon Motorsports in March 2005 signed Jeremy Treadway, Ticonderoga, New York, to fill in for Charles Espenlaub for the April 3 round of the Grand American Rolex Sports Car Series held at the California Speedway at Fontana, California. Treadway driving with Kris Szekeres, Hartland, Michigan, finished that race 10th in the GT class driving a Pontiac GTO. 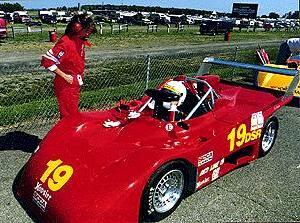 Rennie Clayton, SCCA's 2003 Formula Atlantic National Champion, has started driving in CSR and DSR. RennWerks is building a new Stohr for Rennie from pieces purchased at the "going out of business sale" at Stohr Racing Cars, LLC. RennWerks is letting Clayton drive Richard Steranka's Stohr while his car is completed. Rennie used the Thunderhill double National races this past weekend as a test session. After Steranka's Stohr was bolted back together Sunday morning, Clayton had his first on track experience in the car during the DSR practice session. Only minor issues were uncovered during the session, but that meant that Clayton missed the immediately following CSR qualifying session. After setting ride height and various other changes, the second test session was DSR qualifying, where Rennie was second overall behind defending DSR National Champion John Hill in his tunneled Stohr. The third test session was the CSR race. As the group rolled off the grid, the sky was sprinkling with rain and Rennie, without mounted rain tires, debated about joining the group. He joined the race a lap down and put on a driving performance, storming through the field on slicks while still getting used to the feel of the car. He finished 3rd behind John Chism (who started on rain tires) and John Hill (who pitted for rain tires) in their Stohrs. With the DSR race being the forth test session, Rennie started at the back behind some 34 cars. He ended the race second overall with a best lap time only 0.3 seconds slower than winner John Hill's. Rennie's best lap time was under the previous DSR track record set by Kevin Mitz, in a Cheetah, at the end of last year. Bill Maisey reports that while he was at the March 12-13 Savannah National "Jim Downing (of Mazda Kudzu and HANS fame) came by to inspect the Speads [Bill's newly aquired DSR] and sat in the seat for a bit. 'Beautiful car', he said. There could be yet another DSR manufacturer in the near future. Interesting."